The Renaissance produced many types of patrons: men and women, individuals and families, religious and lay groups, civic bodies and princely rulers. Differing motivations and concerns influenced their relationships with artists and the art that was created. The overwhelming majority of Renaissance commissions were of a religious nature, but they served various ends. Commissions gave greater glory to a person or family, enhanced and embellished a city or a religious institution, honored a saint or accrued as a credit to the Christian “account” of believers—or all of these at once. In this unit we consider artists and patrons in Italy’s aristocratic courts, where patronage was also an important tool of rulership. 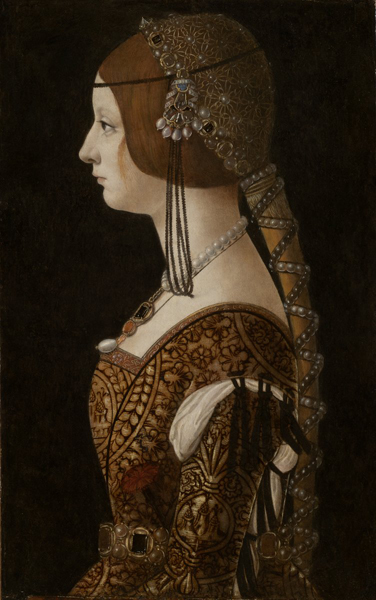 Our discussion is focused on five cities (Milan, Urbino, Naples, Mantua, and Ferrara) and on a brief period, from around 1450 to the early sixteenth century, a time of relative political calm that allowed states to devote funds and energy to ambitious artistic projects.